UPDATE: Joey Gibson has been fired! Summa has confirmed to us that Joey Gibson has been terminated. We sincerely applaud their quick response to the situation, and their commitment to keeping white supremacists out of our community. Joey Gibson (aka Patriot Prayer) and his group of street brawlers (recently renamed as American Freedom Warriors) are known throughout the Portland metro area for organizing rallies attended by white supremacists, Nazis, and bigots. Joey Gibson has a lot of free time on his hands in which to organize these rallies. As a real estate broker, he has a good amount of disposable income, as well as a flexible schedule that allows him to act as security for the bigoted Street Preachers when they harass members of the Portland Pride Parade, organize rallies in concert with ACT for America (a SPLC-identified extremist hate group), visit California for alt-right rallies, and make the sort of contacts that allowed him to invite white supremacist speakers to Portland. Real estate companies normally think of themselves as improving the local community. So why is Summa North, the company that employs Joey Gibson as a broker, enabling activities that harass Muslim and LGBTQ communities? Why is it that Summa North is associating its business with rallies that drew Nazis from Eugene to hang anti-Semitic banners over SE Portland? At that rally, one of Joey Gibson’s invited guests was a known white supremacist, who cavorted with other white supremacists throughout the day. After that rally, racial slurs were shouted at children outside of Hosford Middle School. Does Summa North believe in “free speech” so much, that this is the sort of community they want Portland to be? We suggest that you contact Summa North and ask them why they think their broker Joey Gibson’s vision of a white supremacist-friendly city is best for Portland and Vancouver. Summa North broker Joey Gibson and his group, American Freedom Warriors, consistently hold events in the Portland area that are attended by white supremacists, bigots, and other far-right groups that make a practice of threatening and attacking activists. 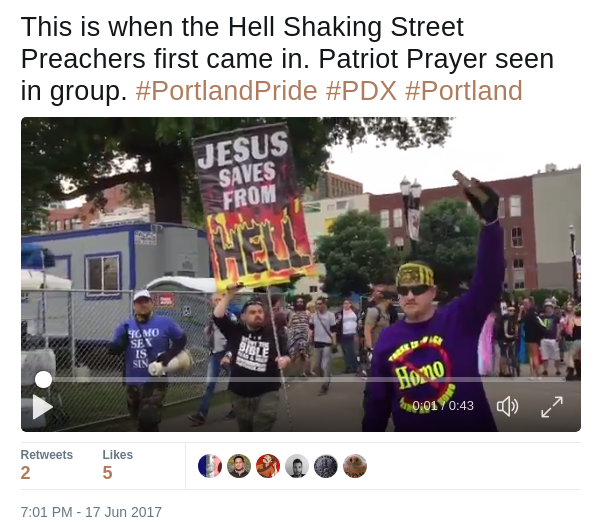 Gibson himself was at Portland Pride parade, providing physical security for the bigoted “Street Preachers,” who threaten and harass immigrants and members of the LBGTQ community. He also organized an “anti-Sharia rally,” that was a thinly-veiled gathering of islamophobic bigots. After he held a far-right rally in downtown Portland on June 4th attended by numerous local white supremacists, children outside of Hosford Middle School were called racial slurs and white supremacist fliers were distributed. Each of his events has been detrimental to at-risk groups and the community as a whole. How can Summa North consider itself part of the Portland metro community when one of their brokers is constantly engaging in activity that threatens that community? This is not about freedom of speech: this is about making our city a place where activists, minorities, and other at-risk community members feel welcome. Summa North is showing itself to be on the side of the bullies and the bigots– not on the side of the people of Portland metro area. If you want to see proof of the abhorrent behavior of Gibson and his cronies, please visit Rose City Antifa’s website for plenty of more information. Also, do feel free to contact Joey Gibson, and let him know what you think about the effects of his rallies on your city. Tell Summa North to Stop Funding White Supremacy!